Note: As of July 2017 this is out of date. I previously had a project running Ghost on Digital Ocean using their setup guide for Ghost on a small Digital Ocean droplet running Ubuntu 14.04 LTS. This was working fine, but I’ve since decided to check out Vultr and wanted to get it setup using Ubuntu 16.04 LTS. I started by using the many guides available online, but none specifically addressed some of the changes of Ubuntu 16.04 and many commands were not working. This guide will walk you through the steps I took to install Ghost CMS on Ubuntu 16.04 LTS using Nginx as a web-server/proxy and Let’s Encrypt for security and to enable HTTP/2. The first step is of course to setup a VPS of your choice using Ubuntu 16.04 LTS, this can be done locally in a virtual machine or using one of the many online services offering SSH access. I’ve chosen Vultr, because it seems to perform slightly better than Digital Ocean in my limited testing. I won’t go into specifics on getting started, you should be somewhat familiar with those steps; otherwise I recommend following this guide ==through step 6== before continuing. Let’s start by logging-in with your new non-root user if you haven’t already. At this point it will ask for your password if you chose not to setup key authentication. Next we will update the apt package manager and install some Ghost dependencies. The next steps will be creating a directory for Ghost and install the necessary packages/software. Ghost.org recommends to install Ghost in var/www/ghost, so that is where we will install it. Ghost is now installed, but it is not ready to go yet. We still have some configuration to do. 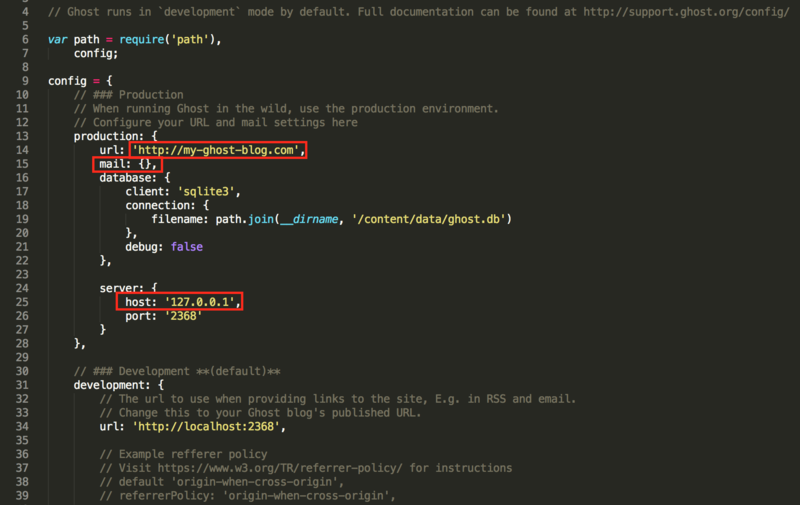 By default Ghost’s configuration file should be located at /var/www/ghost/config.js. However, no such file is installed with Ghost. Instead, the installation includes config.example.js. Copy the example configuration file to the proper location. Be sure to copy instead of move so you have a copy of the original configuration file in case you need to revert your changes. The URL and mail settings, which are in the ‘production’ section, are the key areas of information which need modification. The URL is necessary. Otherwise, the links will take you to the default my-ghost-blog.com page. Ghost can function without the mail settings, but it is recommended that you add them. As of writing, Ghost only requires the mail setup in case a user forgets their password. Ghost has a page with directions for different mail configurations, I will show how to setup with Google Gmail in this example, but there are other options such as Mailgun. We need to open the Ghost config file for editing using the nano text editor. You have to change the value of url to whatever your domain is (or you could use your server’s IP address in case you don’t want to use a domain right now). This value must be in the form of a URL. For example, http://example.com/ or http://0.0.0.0/. If this value is not formatted correctly, Ghost will not start. Also change the value of host in the server section to 0.0.0.0. The items surrounded by red boxes in the image below need to be changed as instructed above. You can obtain the proper server information for Google Gmail here, and we will use this information along with login credentials to setup outgoing mail. This applies to any provider, but for Google I would recommend setting up 2FA(Two-Factor Authentication) along with an App-specific password for greater security. Alternatively, if you are expecting higher email volume or wish for greater security/control, you can setup Ghost with an email transport/delivery provider such as Mailgun. This is an example of /var/www/ghost/config.js with email properly configured for Gmail. Save the file and exit the nano text editor by pressing Control+X then at the prompt Y and finally ENTER. If you set host to ‘0.0.0.0’, you should be able to access your blog in a browser using port 2368: http://your_domain_name:2368 (or http://servers_ip_address:2368), if you set host to ‘127.0.0.1’ this should not work and you will need to complete the steps below before you will be able to easily access your Ghost install remotely. Press Control+C in your terminal to shutdown the Ghost instance. We do not want to run Ghost this way, but this is suitable for testing before we move forward. There are many other Ghost options that can be configured using this file. Visit Ghost: Configuring Ghost for more information. We will now install the latest version of Easy Engine which uses Nginx web-server. I won’t go into the specifics of why using Nginx is preferred over Apache or another web-server, but feel free to do some research. As it is configured now Ghost is only available locally over port 2368, and we want it to be available over the default HTTP port 80 and we will also use Nginx to take the load off of the Ghost CMS software since Nginx is optimized for serving content, though Node is very quick. 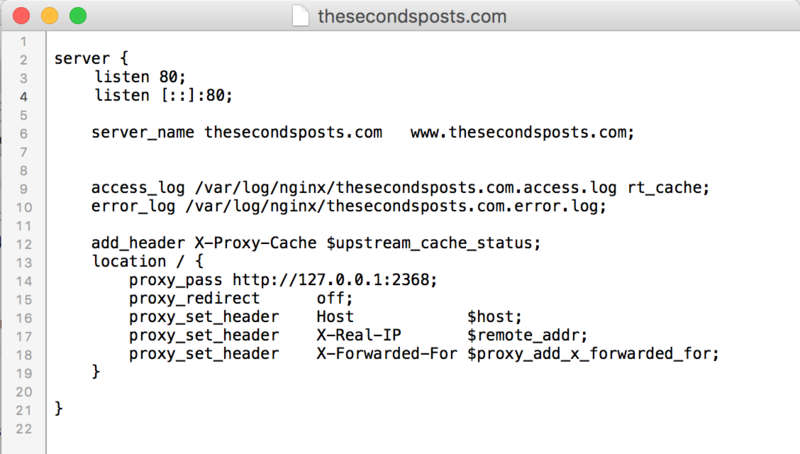 It should look like the following image when edited correctly: After you’ve saved by pressing Control+X then at the prompt Y and finally ENTER, you will need to restart Nginx sudo service nginx restart and test your site. Your application/site should now be available over IPv4 and IPv6. This should show the previous username instead of ‘ghost’ next to your cursor. I recommend at least configuring UFW, but even better would be Fail2Ban since it can protect SSH and Nginx, among other services, against brute force attempts and other types of attacks as well. Obviously you don’t want to need to login an run terminal commands to restart Ghost anytime it crashes or the server is restarted. For this reason we will setup Ghost to be started automatically by a service called ‘supervisor’. Ghost should be available in your browser at this point. 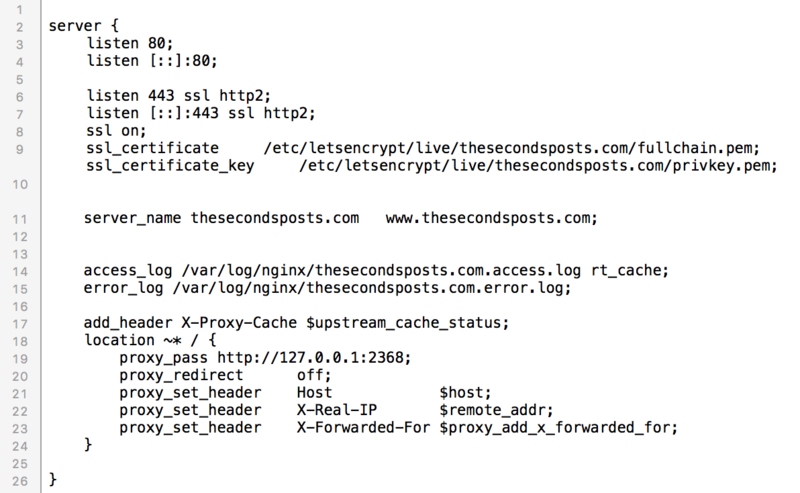 If so, we can continue onto setting up SSL/TLS using Let’s Encrypt in Nginx. Let’s Encrypt requires that your site be configured with a domain name that is pointing to your server. If you are using an IP address only or do not have a domain pointing to the correct location then the following will not work. For setup without EasyEngine, I used the Digital Ocean Ubuntu 16.04 Let’s Encrypt Nginx Tutorial and modified several parameters for improved security such as removing some outdated ciphers and testing with Qualys SSL Labs tester.